Some interesting stats relating to the uptake of business phone systems suggest that there is an increasing surge in customers using cloud based services for telephony and IT. Whilst this is a slow growing market, it is encroaching on the traditional telephony space, where customers invest in premise based equipment that can be scaled to meet their needs. Further to this, customers are demanding an increased level of functionality, with features such as call recording and remote working increasingly needed as businesses contort to meet with their customer demands. 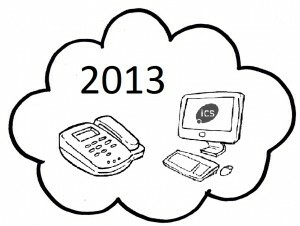 For me, 2013 will see an increased organic growth of cloud based services, however, the skill of the telecoms company to identify the correct solution for each individual client is key. In today’s market, a number of companies are “one trick ponies”, with only a cloud or premises based solution. It is critical to engage with the right company, who carry the complete range of services.